Asthma is a chronic and long term medical condition that causes the passageways of to the lungs to swell and narrow affecting breathing. Asthma has no cure but can be self managed. Patients affected by asthma experience difficulty in breathing, wheezing, shortness of breath, tightening of the chest, and coughing. The passageways called bronchioles are inflammed which restricts the airflow into and out of the lungs. The inflammation is aggravated by mucus production and the tightening of muscles in the bronchial tree. This reduces the airflow and causes a wheezing sound from the patient as he tries to breath in enough air into the lungs. 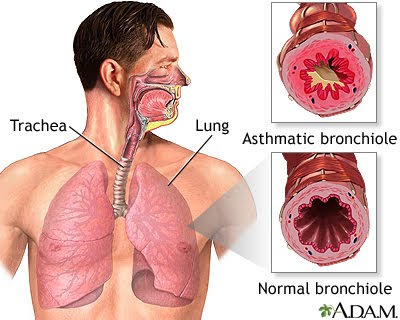 People with asthma have oversensitive bronchioles. Certain substances called "Asthmatic triggers" irritate these airways which in turn start an asthma attack. These triggers are mostly external in nature such as chemicals, dust, mold and mildew, house dust mites, pollen, animal fur, cigarette smoke. Chest infections such as the common cold also can trigger an asthma attack. In some cases, even taking aspirin can cause an episode. Although there is no cure for asthma, it is easily managed through the asthma medication. Inhaled steroids prevent the swelling of the airways and also quick acting bronchodilators which are also inhaled, mitigate the symptoms when an attack happens. Avoiding places where asthma triggers are prevalent greatly helps in controlling the disease. Research conducted at the University of Southern California (USC) indicates that at least 8 percent of the more than 300,000 cases of childhood asthma in Los Angeles County can be attributed to traffic-related pollution at homes within 75 meters (a little less than 250 feet) of a busy roadway. The study also indicates that previous estimates of childhood asthma exacerbation related to air pollution may have underestimated the true burden of exposure on society. The research was published online Sept. 24, 2012, in Environmental Health Perspectives and was conducted in collaboration with the Swiss Tropical and Public Health Institute and Sonoma Technology, Inc. The study focused on the Los Angeles basin. "Our findings suggest that there are large and previously unappreciated public health consequences of air pollution in Los Angeles County and probably other metropolitan areas with large numbers of children living near major traffic corridors," said Rob McConnell, professor of preventive medicine, Keck School of Medicine of USC. The USC study also looked at new state of California policies intended to cut back on vehicular greenhouse gas emissions that cause climate change. An important goal of these policies is to reduce vehicular emissions of greenhouse gases, both by improving fuel efficiency and reducing vehicle miles traveled by increasing use of public transportation. As part of these policies, housing developers would be offered incentives, such as speeding up environmental review to design projects located closer to transit stops with bus or rail service that will encourage use of fuel efficient mass transit. The investigators note, however, that transit stops are often located on or near busy roads and that there has been little study of the impact of these policies on exposure to children living near major roadways. The study concludes that better information is needed to develop the optimal mix of policies that reduce sprawl, encourage walking and use of mass transit to reduce vehicle miles traveled, greenhouse gases and regional air pollution, and also to reduce children's near-roadway exposure to emissions from vehicles still traveling on roadways. "Plans to reduce greenhouse gas emissions and combat climate change offer an opportunity to develop 'win-win' strategies that will maximize the health benefits from reduction both of greenhouse gases and of air pollutants that directly harm children," McConnell said. 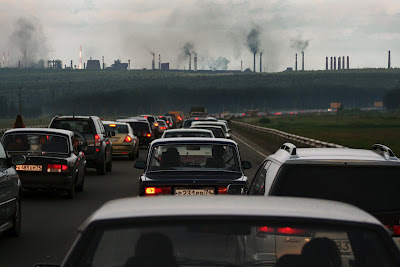 "There is also emerging evidence that other diseases may be caused or exacerbated by urban air pollution, including atherosclerosis, lung cancer, chronic obstructive pulmonary disease (COPD) and neurological disorders," McConnell added. "Thus, policies to combat climate change may have near-term health benefits beyond reducing the burden of disease due to asthma." The researchers estimated the effects of air pollution on children suffering from asthma by using data from sources including the Children's Health Study, a long-term study of effects of air pollution ongoing since 1993. Regional air pollution measurements from the U.S. Environmental Protection Agency and area maps were used to estimate exposure to near-roadway pollution in the Los Angeles area. This information was linked to population data. Asthma exacerbation in this study was connected to regional pollutants including nitrogen dioxide and ozone that cover large parts of the air basin, and to near-roadway pollutants that are responsible for the development of asthma. The researchers found that living near busy roads contributed disproportionately to the more serious exacerbations of asthma in children, including emergency room visits and hospitalizations. In addition, a 20 percent reduction in children's near-roadway pollution exposure would result in an estimated 5,900 fewer cases of childhood asthma in the County, according to the research, whereas a 20 percent increase in exposure would result in 5,900 more cases of asthma.